Pittsburgh website design and website updates for small business. Pittsburgh web design offers small businesses an affordable solution for all internet needs! ISO/TS16949:2002 , the technical specification, was approved and issued in March 2002, as an automotive sector-specific QMS set of requirements which uses ISO 9001:2000 (verbatim) as its base. It replaced ISO/TS16949:1999 based on ISO 9001:1994, and is intended to be an alternative to QS-9000:1998 and other national automotive OEM supplier requirements. (See QS-9000:1998 Sanctioned Interpretations released for July 1, 2002, at www.QS-9000.org). BUT - if your intent is to achieve 3rd party registration to satisfy the requirements of your subscribing automotive customer, then certain added subscribing customer (IATF member) - defined aspects of the registration process and the ISO/TS16949:2002 (called TS-2 from here forward) specification must be satisfied. The International Automotive Task Force, IATF, has developed its own unique and proprietary registration process and requirements for organization registration, and conducts its own qualifying of registrars and of registrar auditors. Evidence of being a potential supplier to a customer requiring TS-2 (or QS-9000, etc.) could include an RFQ issued to the organization, or the organization being on the bid list of the TS-2 subscribing customer. Those organizations and suppliers that do not qualify for IATF recognized registration to ISO/TS16949 , or which supply parts and services to a TS-2 registered organization, are encouraged (in some cases required) to maintain ISO9001:2000 registration. Suppliers normally obtain registration to TS-2 from their current QS-9000 registrar, but if you are not QS-9000 registered, or your QS-9000 registrar is not a selected TS-2 registrar, contact SRI at www.SRIRegistrar.com or the IAOB site for alternative registrars. Supplier Training courses relative to preparing for registration to ISO/TS16949:2002 are available from many sources including SRI-Training and through the IAOB and AIAG. The most effective sources for general public training have shown to be the registrar that knows and practically applies these TS-2 criteria. This web site will be providing more information, comments and advice concerning 3rd party registration to ISO/TS16949:2002 in the near future. If you have questions about TS16949, click here to access our online information request form. *This site is provided as a service by SRI Quality System Registrar, an IATF recognized registrar. Copyright © June 15, 2002 SRI Quality System Registrar, all rights reserved. 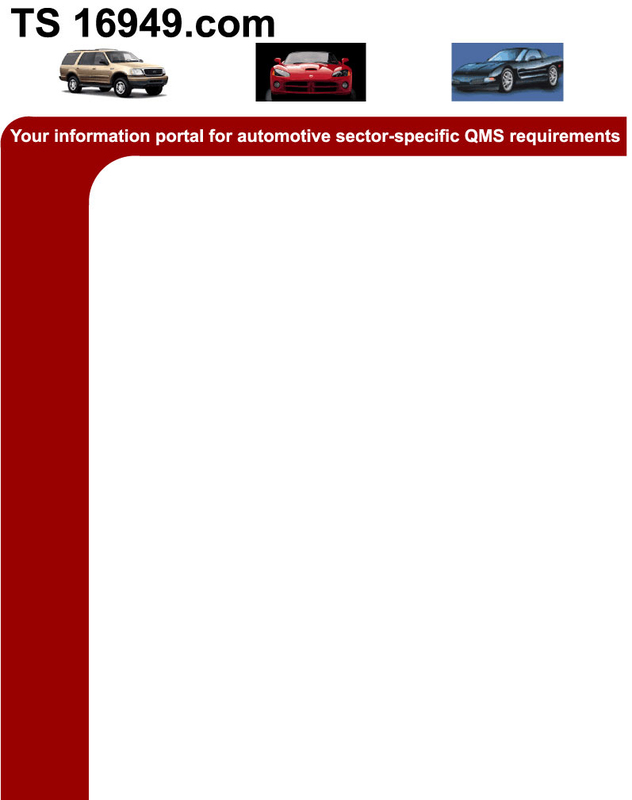 This information has been established by SRI Quality System Registrar (www.sriregistrar.com), an ISO/ TS16949 - selected registrar, as a service for SRIs customers and others within the automotive supplier community that may benefit. All information is copyrighted year 2002 by SRI Quality System Registrar, and represents, solely, the opinions and understandings of the company, and are not intended to conflict with, or replace, any requirements of, or communications from, the IATF, or any other officially designated IATF source or agent. Communications, inquiries, or any updates are invited - please contact us via email: mail@TS16949.com, or mail@sriregistrar.com, or 724-934-9000. SRI not only provides registration to ISO 9000, QS-9000, ISO 14001, AS9000, and ISO/TS 16949, but also provides public TRAINING courses for individuals and organizations who want to update their staffs competency - from QS-9000 to ISO/TS 16949, or from ISO 9000:1994 to ISO 9000:2000.